Nutrition Pure and Simple Blog: Are you making yourself sick? There are some things You Need to Know if You Are Taking Drugs, and/or Nutritional Supplements, and/or Herbal Products. 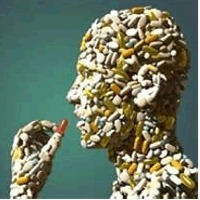 Supplements and drugs can work synergistically, but they can have adverse reactions as well as good results. Example of a good result: the use of a probiotic with antibiotics can decrease the instance of diarrhea and colon irritation that can be caused by the use of broad spectrum antibiotics. A qualified health care provider should evaluate your nutritional needs and coordinate a nutritional program with other health considerations. For example, Statin drugs reduce the formation of coenzyme Q10. A vitamin or a mineral should not be used by itself. For instance, when high levels of zinc are used it needs to be balanced with copper and other minerals. Use a balanced multi such as Ultra Vites before using a high level of an individual nutrient. Common misconception #1: herbs are natural, therefore safe. Herbs represent a body of knowledge unto themselves. They have been used for centuries to help people solve many health problems. Herbal lore attributes different properties to different parts of plants, and many herbs operate synergistically with other herbs and nutrients. Be aware that there can be adverse reactions to herbs. In addition, there are herb/herb, herb/drug and herb/nutrient interaction problems. Read “The Standardization of Herbs” from Time Labs. Common Misconception #3: your doctor knows what you are taking (medicines and supplements) and knows your complete health history. Here is an example of potential problems from the most widely used prescription drug. The statin class of drugs, such as Lipitor, Zocor, Pravachol or Crestor are commonly used to control hyperlipidemia. Statin drugs are HMG Co-A reductase inhibitors and can reduce the formation of CoQ10. The use of Ultra CoQ10-100 can minimize this reaction. Where the statin drugs lower cholesterol levels there are significant side effects affecting muscle physiology. There are noted frequent side effects from statin drugs, such as flu like symptoms, myopathy, myositis, peripheral neuropathy, and muscle wasting disease. For more information: “The Nutritional Cost of Prescription Drugs” is a book which explains how to maintain good nutrition while using prescription drugs, and the various effects these drugs have on nutrition. Paperback, by Ross Pelton, R.Ph. and James B. LaVelle, R.Ph.